sponsoring an architectural project and are interested in holding a competition? an architect considering entering a competition? advising on or judging a competition? a member of the public participating in discussions about a project in your community? Then this part of the RAIC website is designed for you. To inform: To provide information for all stakeholders involved in an architectural competition in Canada. To set guidelines: To set fair and equitable guidelines for roles, responsibilities, processes, and procedures in architectural competitions. To update: To replace the “Canadian Rules for the Conduct of Architectural Competitions,” known as Document Five. 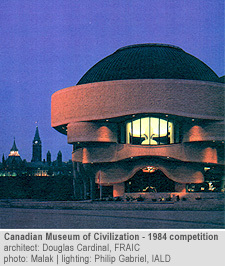 In the past, an architectural competition was defined by the RAIC as including a professional advisor and a jury. Today, however, many competitions do not fit this narrow definition. In cases like this, sponsors have adapted the competitive process for the selection of architects. Therefore, the RAIC now recognizes an architectural competition as a method of obtaining a design solution to a sponsor’s requirements that relies on a process which is fair and equitable to all stakeholders. Endorsed architectural competition: This competition includes a professional advisor, abides by a jury’s decision, is endorsed by the appropriate provincial or territorial association of architects and leads to a commission for the winning architect. Non-endorsed design competition: This competition is not endorsed by the appropriate provincial or territorial association of architects. It may or may not have a professional advisor or use a jury for decision-making. It may or may not lead to a commission for the winning architect. Related selection processes are where architects are chosen by other criteria and do not include the submission of a design. Quality-Based Selection (QBS) is always recommended. Competition Method: Depending on the category, a competition can be run as open, limited, or invited. Find a competition type or competition method in the left column and its accompanying check mark in one of the major categories. In the case where a competition falls into more than one category, the difference depends on the competition rules. A competition may be combined with a related selection process such as QBS. * Endorsed means any competition that has been approved by the Council of the provincial or territorial association of architects. Open and limited competitions for buildings require endorsement as most provincial associations of architects prevent their members from participating in such competitions that have not been approved by their Councils. Competitions for non-building projects and related selection processes do not require endorsement.